excellent personal service and impeccably clean rooms. We spent a great long weekend at the Camelot Beach Resort. Vickie was very helpful in making our reservation and insuring we had everything we needed during our stay. We stayed in Unit 205 which was spacious and very clean. The location was very convenient with the beach right across the street and within walking distance to many restaurants. We enjoyed sitting on the rooftop deck in the evenings and by the pool in the afternoons. Definitely a great value and would stay there again! The staff was super friendly. The room was cute and super clean. Loved the location. Close to the beach and walking distance to everything. Can't wait to go back. The pool was clean and warm. And no problem with parking. We stayed here for a quick weekend away, 2 adults, 2 kids, and dogs. Unit 106 is in the back of the hotel, away from traffic and bar noise, has a full kitchen and a separate bedroom. Camelot is lovely, directly across the street from the beach and within walking distance of restaurants. Very clean, no frills kind of place— just what we were looking for for our family weekend away. Staff was kind and helpful, and we enjoyed the view of the sunset from the rooftop deck. We will be back! This is one of the best places to stay in Clearwater, we have been coming here for the last 4 years and have already booked for next year. The staff are excellent and enjoy what they do. I recently read an ugly review on this location, not sure if the guy was dreaming in how bad his stay was. There is no purple wall in any of the units! Looking forward to seeing all our friends and staff again! I absolutely love Camelot. It is by far the best place I have ever stayed. The entire staff is amazing! They not only treat you like Family, they take care of anything you need. It is clean, clean, clean, very well keep up and a minutes walk to the beach. If you are looking for an amazing place to stay, I would recommend Camelot. For the 4th straight year, I have stayed for periods of 2 days to 1 month in February. Fabulous place! Steps from beach, food, restaurants, dog park, stores, clubs, laundry, free parking- you name it. Wonderful, kind and helpful staff. Ms.Vicki and Ms.Wendy are the absolute best! We come back every year, along with many friends we have met and have kept in contact with; some from Canada, the rest from all over US. You will not find a cleaner or better establishment anywhere. Looking forward to next year already!. P.S. Book ahead, it's a very popular place. I was looking for a nice place for the kids and I to spend the weekend. I called Vicky, and she was such a huge help! The rates were great, we were allowed to bring our tiny dog, and the pool was heated. The hotel was a quiet night. The room was awesome, and updated. Bathroom was small, but that didn't bother me. And the floors were heated. Plenty of towels. Nice Murphy bed, updated kitchen with items to cook with, coffee pot, toaster oven, fridge, stove top. There was a nice Speedway gas station across the street with anything you could want - snacks, meals, Duncan Donuts coffee , muffins and donuts. Beach Fire was across the street and served breakfast, lunch and dinner. Frenchies and Palm Pavilion were also walking distance across the way. DQ, too!! The beach was 100 yards away. There is a park 100 ft next door to walk the dog so they can GO. This set up was fabulous. I couldn't have been happier! The property was very clean & nice. The pool is small, but it works. We had the one bedroom unit w/ king bed & two bathrooms. This would be a good option for families. The staff is really nice & very helpful! It's a great location across the street from the beach. (about a block walking distance.) The beach has beautiful powdery white sand. You can rent beach umbrellas & chairs right on the beach for $15 for 2 hrs. or $22 for all day. You can walk anywhere you want to go as far as shopping/restaurants. This hotel was an unexpected, fantastic find on Clearwater Beach. Not only were we able to take our Yorkie with us, the rental was exceptionally clean & beautifully decorated! We parked our car and didn't move it until we checked out. Everything we wanted to do was within walking distance & the park next door proved to be an excellent place to walk our dog. We especially loved the relaxing pool. Can't wait to return!! Loved the Camelot! Stayed here June 25 thru July 2. Everything we needed was there at the hotel and if we needed anything at all we could find things within walking distance. The beach was a short walk away so we didn't have to take our car at all. We even walked to local restaurants and shops and even walked to Pier 60 with no problems. The only reason I didn't give this place 5 stars is the parking is very limited and if you didn't have to move your car that was the best way to insure parking at the hotel. The off-site parking wasn't too far away though. Loved my vacation here! Every time I vacation the most important part of the stay is distance to the activities I want to do while there. I usually don't worry too much about some of the extra amenities hotels offer because I don't spend much time in my room. But, I wanted to live at The Camelot! And spent more time hanging out at the immaculate kept swimming pool, than we did the actual beach! Vicky and all the employees were the nicest people I met. They had a way to make you feel like family and I will continue to visit this hotel because of that. The place is super clean! And you can tell they work hard at making it truly a little hidden gem. The Camelot is perfect location for walking to the beach and restaurants. The room was very cozy and decorated really nicely. The fridge was convenient. Also, beach chairs, cooler and an umbrella provided in the room. All the stuff you aren't able to haul with you, if you traveled by airplane. …from the moment we arrived and checked in, to the moment we left. The space is far more what you need in a beach stay. The room is very comfortable, big and spacious. The kitchen is perfect for everything from a small cooked meal to a full heavy dinner. The kitchen is equipped with everything no need to brig anything. The place from the parking, the hotel amenities and the exterior are very clean, just recently painted and the pool very clean and warm. Thank you for the wonderful stay. Definitely a see you soon. Camelot is truly a gem of a hotel. We were greeted by Vicky & Wendy as if we were old friends. As our room was on the second floor, both women raced us to the car to unload our belongings. When we opened the door to our room, we were greeted with music and a spotlessly clean suite. The pool is sparkling and surrounding areas are inviting. Fresh towels were available throughout the day. The entire staff is friendly and generously accommodating, making us feel like family. This was our first visit to Camelot, but certainly won't be the last. It may seem likes small thing but I love the towels. Nicer and softer than Disney Deluxe Resorts! Vickie was amazing, she remembered me from my last visit (brother's wedding) even asked how the happy couple was doing. We live locally and have decided to visit much more often. Location is close to the beach, Frenchy's, love the Melrose pool area. Clean, well kept, and will be our home a away from home! Can't miss the rooftop grilling area for a brew and sunset. Thanks Vickie and the entire Camelot crew! We absolutely loved this hotel. Nice staff and our room was very nicely decorated, there were a small kitchen which can be moneysaving. Location was great, just across the road and you're at the beach, which is one of the best in Florida. Awesome hotel! We needed a hotel that accepted large pets and found Camelot! We loved the retro vibe but were totally impressed when we saw our room. We stayed in room 104 with a queen bed, a Murphy bed, kitchenette, bath with a shower. The staff went out of their way to make us feel welcome. You can walk to the beach. There's a park next door where you can walk your pets. I would stay there again with or without my pets. This is Clearwater Beach's best kept secret! I accidentally stumbled across this hotel because I was looking for a pet friendly place to stay! What a nice surprise! Bob, Nick and Wendy were so hospitable! The room which was more like an apartment, was spotless and provided ample space for 7 plus my pooch. The pool area was beautiful, pool toys, floats, beach chairs were readily available- can't forget pool towels also-as many as you needed. I didn't get a chance to use the rooftop BBQ area, but next time I will. They exemplify customer service! Nick knew everyone in my party's name! Thanks for a great experience! 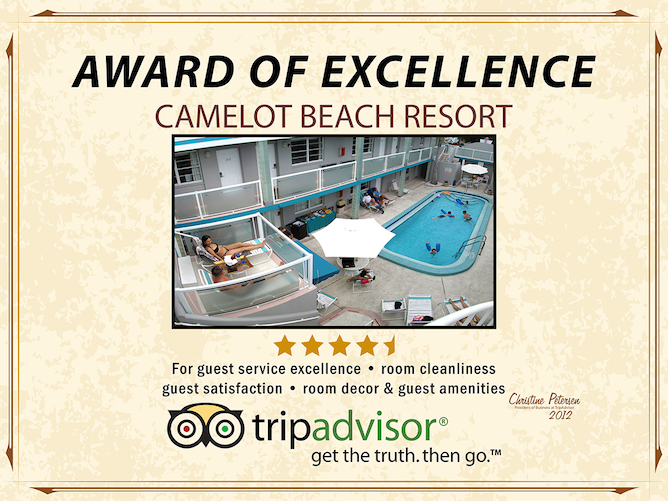 “Camelot is one of cutest and affordable resorts on Clearwater beach." I came with my husband and 14 year old son. My room was 209 , and I was amazed with it! The room had kitchenette with stove and fridge, microwave, small oven and all dishes if you want to cook .I didn’t use coffee maker because I was across the street from "dunking donuts". You also get an ironing board, hair dryer, chairs and parasol for the beach. Beds was very comfortable with clean sheats and colorful pillows. We was welcomed by Vicky who is very organized and super friendly manager of the property. Every day, Nick was bringing fresh and fluffy towels. Everything is walking distance, beach, restaurants, stores, so we parked our car for whole week for free. Definitely, we are coming back. Camelot resort made my vacation wonderful!!!! Our group has been staying here for eight years each March and couldn't ask for a better place for our vacation. Vicki, Nick and Wendy treat us like family, the rooms are always clean and the location is perfect - private but directly across the street from the beach. Highly recommended! This copyrighted website is the property of Vincent Stona and Camelot Rental Management. All Rights Reserved with express permission required from Creator and Developer to reproduce any photos, or copy from this website.